It uses Tabs and bookmarks, reminds a bit about Firefox. 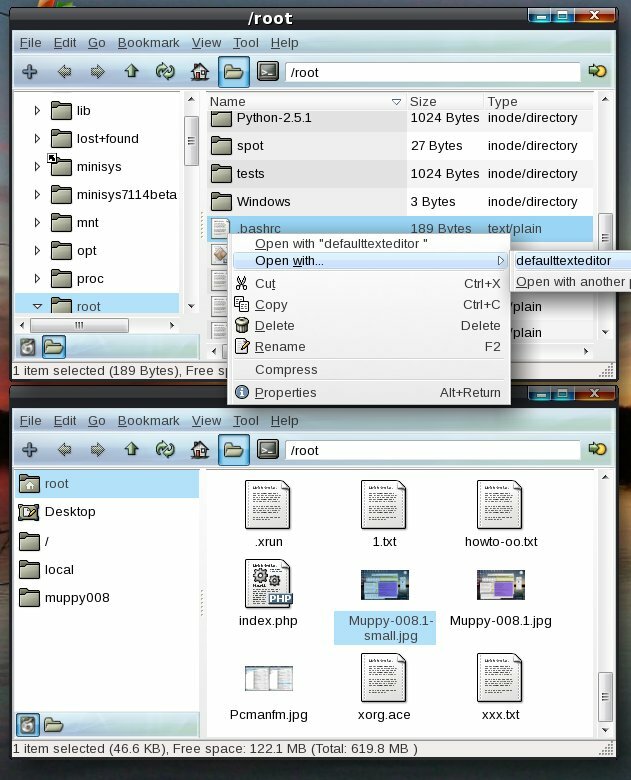 It uses Gtk2, and you can drag&drop files on Puppys Rox-Desktop. You also can drag&drop files with XFileExplorer 1.0.4 (but not older ones). You can create zips with a right-click. It is fast, and shows Thumbnails (previews) of pictures. You even can use a (very simple) Desktop with icons. But this is no real replacement for Rox, as it has limited functionality. But if you have a slow PC, it might be an alternative. I describe that in the other message. All required libraries are included. In an own subfolder, to avoid conflict with other dotpups. You do not need the High-color-theme. The necessary filestructure will be created, if not there yet. The warning "you are running as root" I disabled in the sourcecode and recompiled it. You now can pass size and position to the first opened window. The second then will be opened beside it. If you run it from the startmenu, 2 windows are opened side by side. If no configuration exists, one will be created. It will use the gnome-icon theme, you do not need to edit gtkrc files. Then copy&paste the errors here. I might have forgotten a lib, and would add it then. I added the patched main.c in the lib/ folder. I'm pretty sure the libfamin/gamin is for an improved form of file refreshing. I will look it up tomorrow after some sleep. I remember I got that working already in the Gnome-dotpup, or in Muppy 007 more than a year ago. It is a small server that must be launched by xsession or a startupscript like icewms startup. I really like this one, it could become a replacement for XFE. Maybe with some more patches I can customize it, e.g. add some buttons to open a terminal or so. I added a xmessage based script ("addmime"). It allows you to import the mime-types (file associations) from Rox-Filer. It offers you to backup the old mime-file first. Btw, when I delete a file and reload, it is still visible. I must go to another folder first, then again to the folder where I deleted, to see the change. We really must fix that. Just a suggestion. You should also hack the code to remove the "Open Current Folder as Root" under "Tool" as this returns an error. I believe I commented that out to remove the option. And is there a pup/pet for gpicview( image viewer form the same author)? I did try compiling gpicview, and while it always compiled without problems, it would always seg-fault on me. Maybe with a newer gtk version it would be OK.
a simple newbie question: Installing PCman, I lose ROX features or not? Can I restore after uninstalling pcman? Dingo, no problem, they do not interfere. You don't need to restore anything. PCMan will not replace Rox. You can use it in addition, like tuxcommander or XFE. JB4x4 , yes, good idea. In the next release I'll add that. I think ROX just provides our background and filemanager right? It does not replace Rox (Desktop-Icons/Background and Filemanager). You had to modify .xinitrc to do that. My dotpup does not do it, because I see it as an addon, not as a replacement due to the mentioned bug and limitations for the usage as desktop. But on a slow machine it may be worth to use it instead of rox. We have users that use no rox at all, for them it can be worth a try. We just must find out, why the view is not refreshed when a file is deleted. I've been messing with some of the options when compiling emelfm2 and noticed the same exact problem when it gets compiled with "libfam" support. Maybe pcmanfm depends on this too? The really strange thing though is I need to build it against the libfam currently in puppy and then use the replacement libfam. If I build it against the replacement libfam I get the same exact problem. Disregard the above comment. I can build against the new libfam and it works fine. I think I had an open instance of emelfm2 after installing my newly compiled version. I'm fairly certain the libfam in puppy is outdated and not working correctly. Here's the version I compiled in Puppy 4 (hopefully it'll work in Puppy 3). I compiled it with libfam from Debian stable I think. Solved: Refresh view when files are added or deleted. It just required that gamin_server runs. That is included now (also in my own /lib/ folder to avoid conflicts). Added: An icon to open a consolewindow. Removed: "Tool - Open folder as root"
Added: "Tool - import Mime-types". This runs my import-script. Fixed: import-script created backup when you clicked on "cancel".